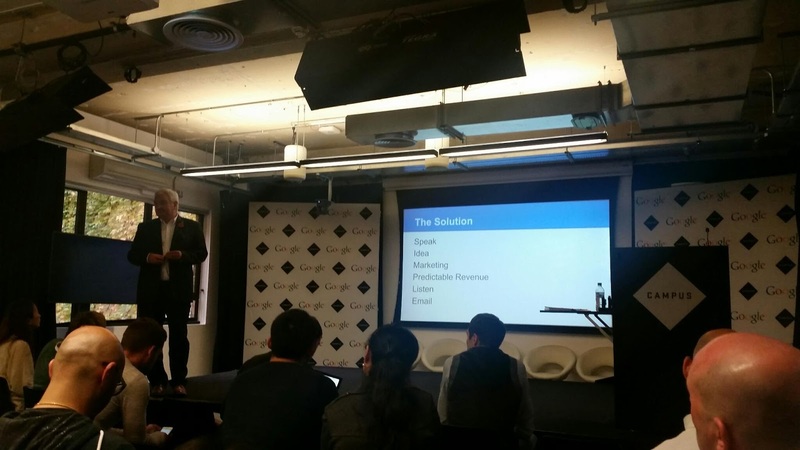 Today I was at @campuslondon and just happened to attend an event on sales for startups. The event was held by Rod Sloane. Rod is also offering webinars in November about how to create effective marketing email messaging. Rod's technique suggests following some steps based on a SIMPLE acronym. Speak: take opportunities to present and speak at events. It will help boost your confidence and leads. Idea: Articulate your idea in terms of what your prospective customer wants, not necessarily what they need. Marketing: Effective marketing should be driving leads which are aligned with your sales strategy. Predictable Revenue: Buy it, read, apply, rinse and repeat. Listen: Take a course on listening, it is the top skill for sales, when you are cold calling and someone says "if I had £10k to spend I wouldn't spend it on you" ask what they would spend it on. * Send emails to SME CEO on Sunday between 5 and 7 pm. * Start with a simple message, shorter is better like "are you looking for a new website". * Always follow up on the dates you suggest. Insightly can help. * It can take 27 approaches to buy a product. Think about sending 8 emails with different content targeting issues and challenges. * One way to open a sales call is to say "This is a sales call" to see if they want to hang up. * If in doubt use the one page marketing plan template.